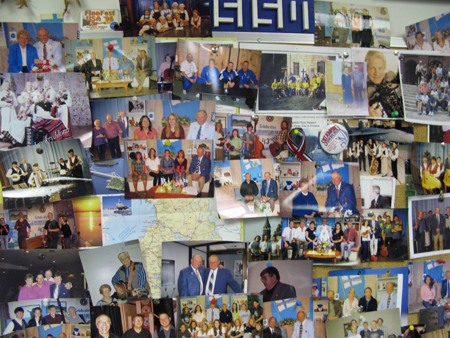 I had a very interesting interview with Kent who is the archivist of the Finnish Heritage Centre. Many people have told me that high working moral, honesty and politeness is linked to their Finnish genes. I wonder if other characteristics often related to Finnish people follow, too: alcoholism and depression for example. We talk about this with Kent. Kent takes me to Calumet which is said to be a ghost town, but it’s not that ghosty, I think. The mines are gone and the area is not so lively anymore. The mines left unpleasant heritage behind them: poisoned lake. Kent says that if one would swim in it, their limbs would fall off. We also visit Keweenav National Historical Park briefly going trough the office building and former library/public bath with historian Jo Urion. Marianne, Honorary Consul of Finland in Minneapolis, picks me up from the airport. I also meet Carole and Danish Honorary Consul Annelise. We go for dinner with Marianne, she tells about her work in Tampere University. She wants to look at the Finnish-American community not only from the point of view of US but also Finland. And she also is interested in how contemporary immigration could be related to the historical Finnish immigration. I start my day at Finnish-American Heritage Centre and immediately get caught in an interesting discussion with the director James Kurtti. He has wast knowledge about the history and culture of the area. He tells about division in conservative, religious groups and more liberal, leftist groups in Finnish-American community. Supposedly this polarisation still remain in US. Regardless of the disagreements of the history, Jim thinks it is important to have Finnish-American identity. United States is a big country with many people and cultures. You have to have something for yourself, something to identify to. Finnish-American are more talkative and open than Finnish people, but more quiet compared to the rest of US. One very interesting detail is that FBI started a Klux Klux Klan amongst Finnish-American people. The main idea was to scare the leftists. We have a very emotional interview with Beth, her mother Joan and Joan’s cousin Evie in the evening. It is sometimes hard to remember all the old family stories. But it is probably easier to tell them to a more or less stranger like me. We visit Joan’s old school and her other cousin’s Jane’s house. Jane passed away recently. 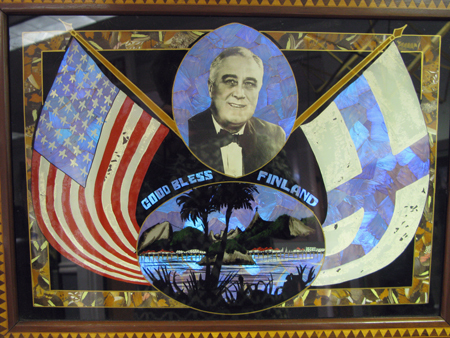 Carl Pellonpää, icon of the Finnish American community – invited me to be a guest in his show called Suomi Kutsuu. It is the longest running talk show in US. Carl started it 48 years ago. We have fun, but I also feel a little bit sad. When Carl stops working on the show, there will be no-one to continue it. Elsa takes me to Hancock. The street names are in Finnish… I heard the signs have been done recently. We have a very nice dinner with Finlandia University president Philip and his wife Renee. We talk about education, but also: what does it matter if you have Finnish heritage or any other nation’s heritage either? During my visit in Iron River, nothing was about contemporary Finland or Finnish culture. 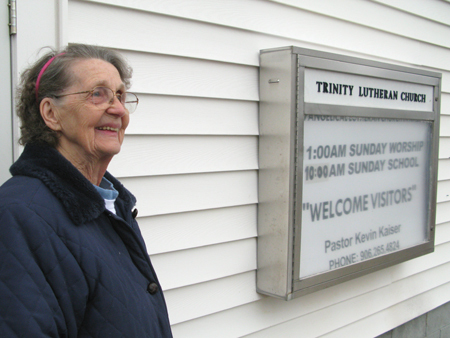 It is about heritage that Betty and her siblings want to pass on to the next generations. I find this fascinating. It is a reflection of Finnish culture from the past and nothing has changed. I eat food that is said to be traditionally Finnish. I have never heard of it. People don’t need to know what is going on in Finland now, because it is a country that doesn’t really exist to them. Why should it? Iron Country Museum is a pleasant visit. It is very coherent museum with also outdoor exhibits. Many volunteers have spend hundreds of hours moving and setting up buildings in the museum area. I hear a story how Carrie Jacob Bonds house was moved to the museum area and while moving it, money was collected from people on the streets. You could really see how your money moved the house inch by inch towards the museum. We visit Kangas old farm. Jack gives me his mother cap she used to wear at work. I promise to take it to Finland where Jack’s mother never got to visit again after she immigrated. I will take a picture of the cap in some nice place. I took many photographs of Jack trying capture his thoughtful eyes that can really see you as a person. I wasn’t doing very well. But then we went to Kangas Bay. It was the very last picture I took – and it was the one. Betty, her grandchild Amanda and her brother Jack come to pick me up to Iron River. We stop by the saw mill first, because forestry is an important living in the area. The next stop is Crystal Falls where Betty’s and Jack’s mother came by train when she immigrated to the country. The stories are many as we drive trough the town and visit a monument for Finnish immigrants in the yard of the City Hall. There is a city archive from Iron River in the City Hall – the story goes that somebody got the clerks drunk in Iron River and stole the archive. Jack wants to introduce me to everyone we meet on our way. And people seem to be quite happy to talk with someone who is from Finland. I doesn’t matter who we meet, everyone seems to have Finnish descent. 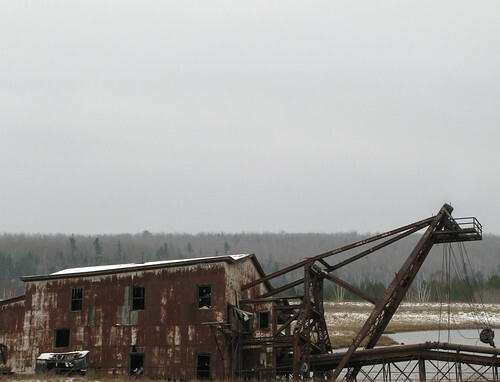 Iron River was a mining town and is suffering deep depression. The mines are still working but the process of the mining have developed and needs less work force. There are a lot of houses for sale in the town and some buildings are basically ruins. Churches are many, too. Each nationality that immigrated to US had their own church and the masses were in their own language. People don’t go to churches that much anymore and all of the churches are English speaking nowadays. 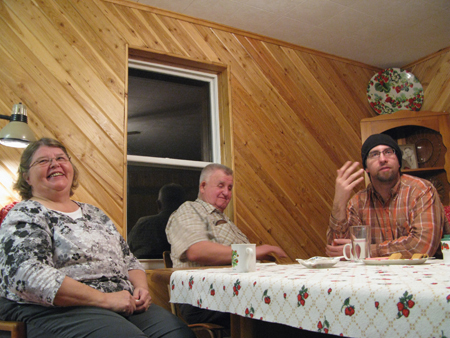 We do an interview in Betty’s wonderful log cabin in the evening. The situation is new to me, because there are four people to interview at the same time: Betty, Betty’s sister Faye, Jack and Jack’s son Rich. Betty is a person to whom everybody want to come to. Door opens and closes, people come and go. I try to adjust to the situation, but as an introvert person, I don’t necessarily keep up with the discussions all the time when there are so many people. I feel longing: I’m not sure if I have this close, warm family at home or belonging to a community. I’ve always walked alone, I suppose. But I wish I would have people visiting me when I’m 73 years old like Betty.